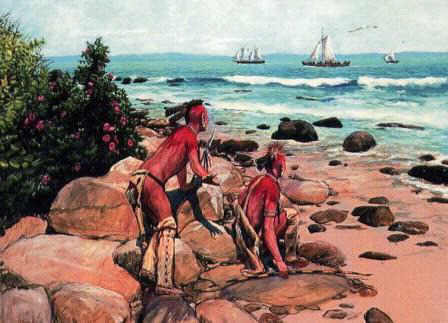 The Pequot Native Indians of Connecticut and Rhode Island were defeated by the colonists led by John Underhill and John Mason, and the Narragansett and Mohegan who were their allies. Many native Indians were killed and others sold into slavery. Pequot War Summary and Definition: The Pequot War was a short, vicious war in 1634-1638 between the Pequot tribe, who were members of a powerful tribe of Algonquian-speaking Indians of Connecticut, against an alliance of the Massachusetts Bay, Connecticut and Plymouth English colonies with their Indian allies, the Narragansett and Mohegan tribes. The Pequot were defeated in a crushing defeat in which they were forced to sign the Treaty of Hartford declaring the Pequot nation to be dissolved. The significance of the Pequot War in history was that it tipped the balance of military power to the English, instead of the Dutch, opening the way to New England’s settlement. The penalties of fighting in the Pequot War brought the wrath of the English and their allies on to the Pequot people. The Treaty of Hartford stated that survivors of the Great Swamp fight were to be divided as slaves among the Indian allies of the English. The Hartford Treaty also stated that no Pequot could inhabit former Pequot territory. And finally the name Pequot was to be erased and any Pequot slaves had to take name of tribes to which they are enslaved. So cruel and devastating was the outcome of this war that no Connecticut Native Americans challenged the colonies again for nearly forty years, when, in 1675, King Philip's War erupted. This short History Timeline of the Pequot War provides facts and information about the history, years, key dates, key events and key people who fought in this war. 1634: Smallpox epidemic transmitted initially by the European new comers. 1637: Captain John Mason sent to punish the Pequot at their main village. He was joined by John Underhill. They failed to take the heavily defended village so sailed east and stopped at the village of Misistuck, present-day Mystic. 1637: The Mystic Massacre of women, children and older men who were killed or burnt to death in their village. Only 7 Pequot survived out of an estimated 700 people.